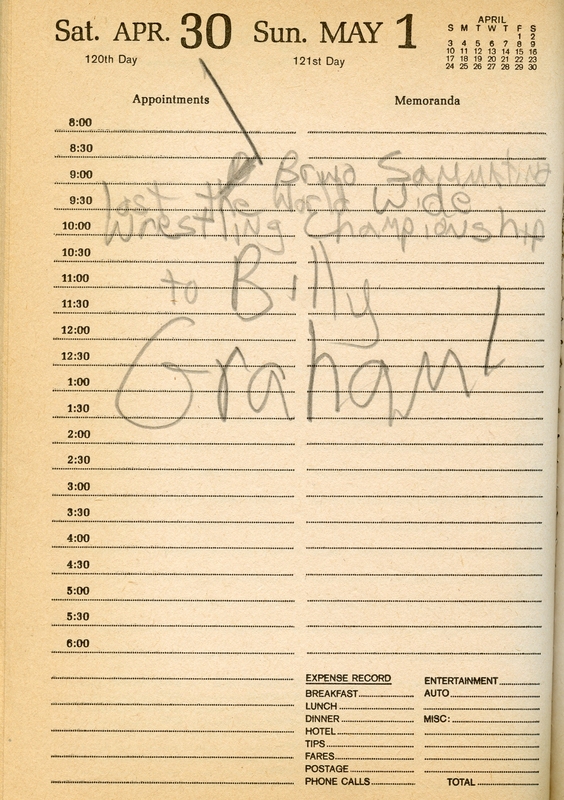 April 30, 1977: Even at my young age – a mere 11 years and 10 months – I knew enough to note the momentous event of the date in my rarely used desk diary: legendary Bruno Sammartino lost the WWWF championship to the colorful and flamboyant Superstar Billy Graham! Over the prior two years – less, actually – I’d become a big fan of the “sport.” When we returned from Saudi Arabia in the summer of ’75, after a near 5-year spell, I was a few months shy of 10. I was totally out of the loop on current American everything. I didn’t know anything about baseball, basketball, football or hockey, color TV, TV shows, popular music, or anything else. Oh, I knew about Mighty Mouse – the only Saudi TV station played those cartoons, along with a variety of other American and British shows, most of which were older than I was. Returning to the States was a bit like getting tossed into the deep end of the culture pool – all I could do was flail around and pray not to drown. One thing that I grabbed hold of: pro wrestling. The colorful characters, the drama and violence grabbed hold of my young imagination. I watched the syndicated shows that aired every weekend, bought and read the wrestling magazines, and slowly, ever-so-slowly, came to realize that “sport” wasn’t totally on the up-and-up. I thought of that earlier this month when it was announced that Bruno had passed away at the age of 82. He was a good man, a great champion – but not my favorite wrestler. That was…yep, you guessed it: the Superstar! The excitement of learning he had won the coveted championship belt is evident in my scrawl, I think. Beyond pro ‘rassling, as I now call it, I was often glued to the TV…though pop music was gradually infiltrating my world. The previous week, I picked up the Monkees’ Greatest Hits; and, by year’s end, I’d also own The Osmonds’ Greatest Hits, the soundtrack to The Spy Who Loved Me, and a few Elvis Presley LPs. But, back to TV: I watched almost everything ABC, including the Hardy Boys/Nancy Drew Mysteries on Sunday, The Captain & Tennille Show every Monday night, and the Brady Bunch Variety Hour when it aired in the same slot; Happy Days, Laverne & Shirley and Eight Is Enough on Tuesdays; Welcome Back, Kotter on Thursdays; and Donny & Marie every Friday. I’ve written a fair bit about this year before, so won’t dredge up the same stats here. (And now that I’ve looked them over, there is some overlap in the chart hits…but rest assured that the renditions featured here are different than the ones there, wherever there may be.) To revisit those past entries, along with everything else 1977-related I’ve written, go here. And, with that out of the way, onward to today’s Top 5: April 30th, 1977 (via Weekly Top 40). 1) Glen Campbell – “Southern Nights.” The No. 1 single in the land this week was this joyous tune from the Rhinestone Cowboy. Written by the legendary Allen Toussaint, it conjures the magic of childhood memories, star-lit nights and family. 3) Thelma Houston – “Don’t Leave Me This Way.” Say what you will about disco, but know this: There were plenty of great – and I do mean great – singles that came out of the genre. This is one of them. Written by Kenny Gamble, Leon Huff and Cary Gilbert, the song was originally recorded by Harold Melvin & the Bluenotes in 1975, and hit No. 3 on the disco charts. This version? It went to No. 1 on the disco and pop charts – though, this week, it dropped from that top spot to No. 3. 4) Leo Sayer – “When I Need You.” Rising to No. 4 from No. 9 is this song from bushy-haired Leo Sayer, of whom I know little. In fact, I’ve never knowingly heard any Sayer recording until this very moment, while writing this sentence. (And now that I have, I don’t feel compelled to seek out his other hits.) Anyway, this song was written by Albert Hammond and Carole Bayer Sager, and was first released by Hammond in 1976; and was later covered by Rod Stewart, Celine Dion and Luther Vandross, among others. 6) Yvonne Elliman – “Hello Stranger.” Rising to No. 24 from 33 is Yvonne’s smoky rendition of the classic Barbara Lewis hit. The 1970s were an odd time in America, beginning with tumult on the streets and college campuses and ending with the closest thing to a whimper this country has ever emitted. Post-Watergate and post-Vietnam, the nation sputtered sighs that mixed relief with resignation, and a recognition that—for the first time since the Depression—the American Dream might just be out of reach. The post-WWII economy that birthed the middle class and suburbia was flailing from oil embargoes, inflation and unemployment. Times were tough, in other words, and best articulated by Merle Haggard in his classic “If We Make It Through December”. In fact, despite his many misdeeds, and there were many, my hunch is that the Watergate scandal never would’ve gained traction if President Nixon had handled the economy with the same verve as he did, say, detente with China. Instead, inflation gradually increased; and, by his last year in office, 1974, it averaged 11 percent. While there’s only so much a government can do to lessen economic woes, perception plays a pivotal role. People expect the president to address their concerns; and Nixon never did. Unfortunately, the message wasn’t what Americans wanted or needed to hear. Carter would’ve been better off saying: “Times are tough, and getting tougher, but we’ll get through this. Here’s how,” and then ticking off his six-point plan, instead of hectoring the American people. Leaders lift folks up, and never chastise them about “self-indulgence” and “consumption” when, for most, such extravagances aren’t options. Looking back, one can see why the decade’s music veered hither and yon, moving from fluff and escapism to grit and certitude. Saturday Night Fever, the movie, is a good encapsulation of the need, at times, for fluff and escapism: Tony Manero (John Travolta) leads, on a day-to-day basis, a dreary life. He doesn’t live to dance, but dances to live. So, for today’s Top 5: Songs of the Seventies. There’s a decade’s worth of material to pull from, of course, and much that I could (and probably should) use, but these five songs – mainstream all – spoke to the hearts and minds of millions of people at the time, and have spoken to many more in the years since. They articulate the dreams and desires of and for escape, however temporary, and do so in a timeless manner while eschewing saccharine sentiments. 1) Bruce Springsteen & the E Street Band – “Born to Run,” 1975. 2) Jackson Browne – “Running on Empty,” 1977. The Eagles – “Hotel California,” 1976.